Exclusive 5-star self-catering accommodation for couples visiting Falmouth. Comprising four boutique style one-bedroom apartments and a fabulous open plan studio. 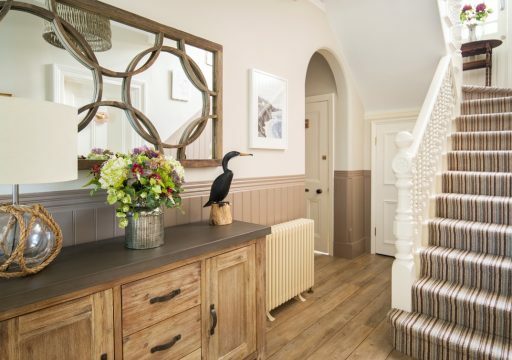 Kinbrae House is a lovely Edwardian property that has been completely refurbished to exacting standards by husband and wife team, David and Tamara. Kinbrae House comprises four exclusive boutique one bedroom apartments and a fabulous open plan studio all offering luxury 5 star self-catering holiday accommodation for couples visiting Falmouth; available year round with private parking. Two of the largest apartments have twin or super king bed configurations so are ideal for friends wishing to share an apartment. Kinbrae House, set in a beautiful coastal area of Falmouth, is an ideal place to stay for guests wishing to explore Cornwall and beyond. 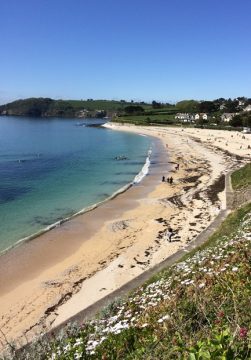 Within easy walking distance from this prime location are the Blue Flagged beach of Gyllyngvase, The Princess Pavilion, the Harbour, Falmouth Town Centre and Events Square, making Kinbrae House an ideal base for a stress-free stay in Falmouth. The largest apartment, called Cornish Chough, is located on the ground floor and has a private entrance, garden and terrace and can accommodate one small or medium sized well behaved dog. (terms and conditions apply). The four stunning apartments are available on a weekly basis during high season and from a three-night minimum stay at other times of the year. Puffin Studio has a three-night minimum stay. Prices include the finest quality bedding and linen, fluffy towels, bathrobes and slippers, complimentary toiletries, personal safe, full length blackout curtains, superfast fibre broadband to each apartment, SMART TV, DAB radio, NEFF kitchen appliances, modern tiled shower and bathrooms with constant hot water, central heating, and lots of lovely extra thoughtful touches. Please visit our website for more details, availability, prices and to book your next holiday in Cornwall: www.kinbraehouse.co.uk. Facilities highlighted are a guide only. Contact the proprietors for further information.